A lovely, round-shaped small lilac tree / shrub, Charles Joly (Syringa vulgaris 'Charles Joly') has a an erect form, typical of Lilacs. 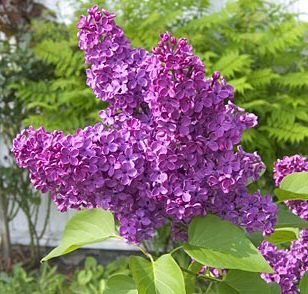 One of the classic lilacs with pretty single very dark red-purple flower clusters that are highly scented. The flowers have been described as heart shaped but on closer inspection we could not find any shapes similar to ventricles, veins, arteries or nerves so we suspect the Syringa flowers are more artistically/romantically heart shaped than literally. A small height tree / shrub, so expect a height of around 4 metres (13 foot) after 10 years but could go on to grow more depending on local conditions e.g. if you have provided your garden as a testing ground for John Innes and they have built a bio dome over your land and planted your Charles Jolly in a section marked "EXPERIMENTAL MAXIMUM GROWTH" then you may just get a little more. This tree / shrub is supplied at a height of 50-120cm in a 7-12 litre container for year round planting and better results than from either bare-root or rootballed stock. The difference in pot size is because we have to negotiate with pot suppliers every year and sometimes we get a better deal for volume on certain sizes. Syringa Charles Jolly either currently has or did have the RHS AGM (Royal Horticultural Society Award Of Garden Merit). The RHS will sometimes remove the award, not for bad behaviour such as when celebrities are stripped of their Knighthood but because another Syringa may have come along and performed better. Wen we say performed, we mean growth rates, colours, fragrance etc, not ability to stand on a stage and entertain. It will do well in fertile, hummus rich, well drained and alkaline to neural soils and is listed as Chalk tolerant which according to the RHS actually means it prefers it. Plant in full sun for best results and an occasional thinning of the branches will promote new growth. If after pruning it looks like a drunken and malicious Edward Scissor hands has been in your garden then you have gone too far.